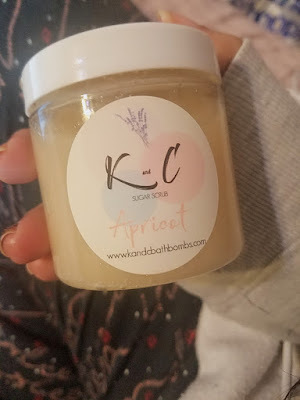 As promised, today I will be reviewing two incredible products from K and C bathbombs. 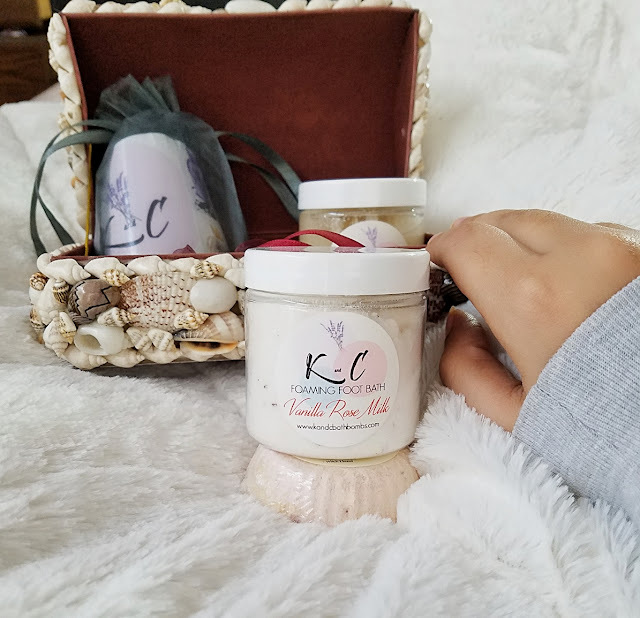 Recently, I received some of their best-selling products – Vanilla Rose Milk Foot Scrub, Apricot Sugar Scrub & The Awakening Blend Shower Fizzy. The brand being fairy new in the market, I wasn’t sure what would the experience be like and now after using for a while, I am ready and excited to review them. 1. Starting with Vanilla Rose Milk Sugar Scrub, now the best thing I like about this product is the fact that it’s 100% natural. it smells heavenly but not overpowering. I personally like to soak my feet in Luke warm water with a scoop of Vanilla & Rose foot bath. The aroma is stress reliving while milk & rose helps moisturise my feet. We all know what happens to our feet, especially in winter. Packed with argan & olive oil, this product gives a natural boost to your tired feet after a long day at work. It also has small dry rose petals that feel so soothing to your skin. 2. Apricot Sugar Scrub: Apricot is known for it’s nourishing benefits. Enriched with vitamins & omega 6 fatty acids, it allows the nutrients to penetrate deeper into your skin. This sugar scrub has quite a refreshing smell that will sure soothe your senses. I am very choosy when it comes to sugar scrub, as I don’t like the ones that are too rough or harsh on your skin. Surprisingly, I did not only find the scrub extremely soothing, but fell in love with the way it made me feel. This is a true indulgence! I can easily say that this is one of my favorite scrubs and I would be using this for a very long time. Another amazing thing about this product is its nice cooling effect. It genuinely makes your skin feel fresh & relieved. This scrub too is made of all-natural ingredients with no preservatives added. Besides Apricot, the scrub is loaded with argan oil, apricot kernel oil & 24K karat gold mica. The packaging is cute & colourful. It’s a colour coordinated jar packed in a net pouch. .
Would I recommend this? Oh yes! If you don’t try this, you are certainly missing out something heavenly! Founded by Anamika, Florid Maven is the handbook for all your lifestyle, fashion, beauty & travel needs. It gives a fresh perspective and updates on the newest trends and inspiration for your day to day lifestyle. It's the perspective that matters!